India continued their perfect record at the World Cup with a six-wicket win against Zimbabwe in Auckland. Suresh Raina (110 not out) and captain MS Dhoni (85 not out) shared a 196-run partnership to chase 288 at Eden Park. Holders India had already qualified for the quarter-finals where they will face Bangladesh, but victory marked a 10th successive win in World Cup matches. Zimbabwe captain Brendan Taylor had earlier scored 138 off 110 balls in his final international appearance. Left-hander Raina, who reached his century in 94 balls, was gifted a lifeline on 47 when Zimbabwe all-rounder Hamilton Masakadza dropped a simple chance. His error at short fine leg from a top-edged sweep shot came with India’s reply in the balance at 157-4. India were already guaranteed to finish top of Pool B and wrapped up their sixth win from six matches, but defeat for Zimbabwe meant their World Cup campaign concluded with only one win from six. India captain MS Dhoni, who won the toss and elected to field, admitted it had been a good test for his side ahead of the knock-out stages. “The wicket was doing a bit in the second innings and the Zimbabwean bowlers exploited that well, with slow bowling,” he said. “Raina is a key player for us and the partnership we put on was very good. Zimbabwe wicketkeeper Taylor’s brilliant century came in his final outing for his country, having elected to join Nottinghamshire on a Kolpak contract for the forthcoming English county season. The 29-year-old smashed 15 fours and five sixes in his stay at the crease to ensure Zimbabwe recovered from a sluggish start to post 287. It was the right-hander’s second century in the tournament, havingscored 121 against Ireland in their previous match. Former champions Pakistan survived a scare to pull off a dramatic 20-run victory over Zimbabwe and record their first win at the 2015 World Cup. Skipper Misbah-ul-Haq’s stubborn 73 and a fiery half-century from pace bowler Wahab Riaz helped the 1992 winners recover from 4-2 to reach 235-7. 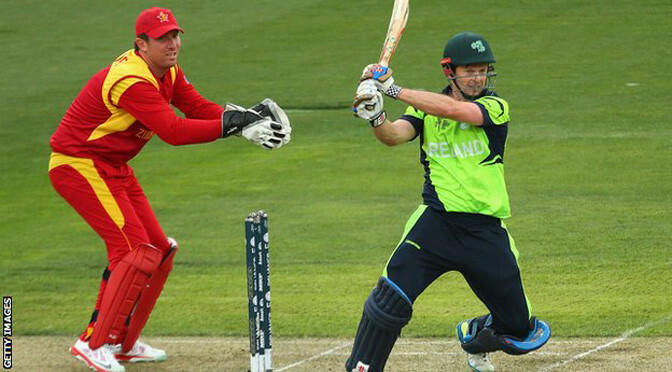 Brendan Taylor’s 50 looked to have put Zimbabwe on course for a famous win. But Mohammad Irfan, with career-best one-day international figures of 4-30, and Riaz (4-45) won it for Pakistan. Riaz became the first Pakistani to score a fifty and take four wickets in the same World Cup match – and only the eighth cricketer to achieve the feat. And victory was important for Misbah’s men, who, after heavy defeats by India and the West Indies, would have faced an uphill battle to progress to the quarter-finals had they lost again. Despite a backdrop of fierce criticism from the public and former players back home – and with chief selector Moin Khan forced to return from the World Cup after visiting a casino – Pakistan posted their highest score of the tournament so far, though their innings got off to a wretched start. After winning the toss and choosing to bat, Pakistan were rocking at 1-1 and 4-2 as Tendai Chatara claimed the wickets of openers Nasir Jamshed and Ahmed Shehzad. But skipper Misbah played a vital innings, steadying the ship as wickets regularly fell around him – including two in one over when Williams dismissed Umar Akmal and Shahid Afridi in the space of three balls. Afridi, celebrating his 35th birthday, went for a duck. Only a late flurry from Riaz – his 54 coming from 55 balls – injected some urgency into the Pakistan innings and gave them a meaningful total to defend. Zimbabwe lost Sikander Raza and Chamu Chibhabha cheaply – Irfan taking both – but Taylor’s half-century and Sean Williams’ 33 from 32 balls took them to 128-3 and appeared to put them on course for victory. However, Riaz repeated his batting heroics with the ball, sharing eight wickets with fellow left-arm paceman Irfan as Zimbabwe crumbled. Injured captain Elton Chigumbura, who was helped off the field with a suspected quadricep tear while fielding, tried valiantly to steer Zimbabwe to victory but was last man out for a run-a-ball 35. “It is always disappointing to lose a game like this when you feel you have a chance to win,” said Zimbabwe captain Elton Chigumbura. While Zimbabwe will be frustrated not to have registered only a fourth ODI win over Pakistan, Misbah’s team now head into their next Pool B game against the United Arab Emirates on 4 March with renewed hope of making the last eight. Chris Gayle hit the first double century in World Cup history as West Indies beat Zimbabwe by 73 runs under the Duckworth-Lewis method. The left-hander smashed 215 off 147 balls, including 16 sixes and 10 fours, in West Indies’ 372-2 in Canberra. He added an ODI record 372 for the second wicket with Marlon Samuels, who made a relatively sedate 133 not out. Chasing a rain-revised target of 363 off 48 overs, Zimbabwe mustered 289 as Gayle took two wickets and a catch. Having lost their opening game to Ireland, West Indies’ win took them level on points with India at the top of Pool B, going into their meeting with South Africa on Friday. Although Zimbabwe’s bowlers suffered heavily at the hands of Gayle, their batsmen deserve credit for a respectable run chase that featured Sean Williams’s 76 and 52 for Craig Ervine. Jerome Taylor claimed 3-38 and West Indies captain Jason Holder 3-48, but their figures were footnotes in a game that will be remembered for Gayle’s savage hitting. Fortunate to survive an lbw review off his first delivery after opening partner Dwayne Smith fell to the second ball of the innings, Gayle batted with uncharacteristic patience in bringing up a 105-ball century. However, his next hundred spanned only 33 deliveries – and his fourth fifty a mere 12 – as he and Samuels flayed 152 off the final 10 overs. 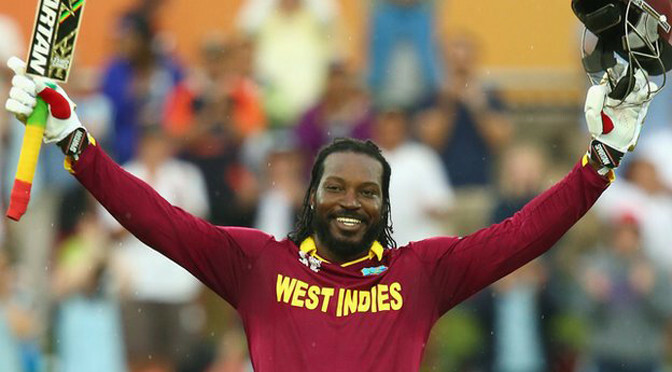 “It was a fantastic day from a personal point of view,” said Gayle. Samuels’s occasionally scratchy century went almost unnoticed as Gayle repeatedly cleared the boundary, swinging disdainfully over mid-wicket and driving powerfully straight. He eventually fell off the last ball of the innings, having equalled the record of 16 sixes in an ODI innings shared by Rohit Sharma and AB de Villiers. Despite losing Regis Chakabva and Hamilton Masakadza inside the first five overs of their reply, Zimbabwe scored at almost seven runs an over. The resourceful Williams was the chief architect of a chase that unravelled only after he top-edged a pull off Holder. Part-time off-spinner Gayle bowled Ervine round his legs six overs later to reduce Zimbabwe to 226-6 and remove any doubt over the outcome of the contest. He finished with 2-35 and capped a remarkable day with an exaggerated dive and roll after catching Elton Chigumbura at extra cover off Taylor. South Africa – three-time beaten semi-finalists – were among the pre-tournament favourites, but were less than convincing here, despite winning their 27th consecutive ODI meeting with Zimbabwe. Miller and Duminy rebuilt against Zimbabwe’s spinners, the former hitting nine sixes and taking seamer Mire for 30 off the 48th over with three fours and three sixes, one of which went out of the ground. 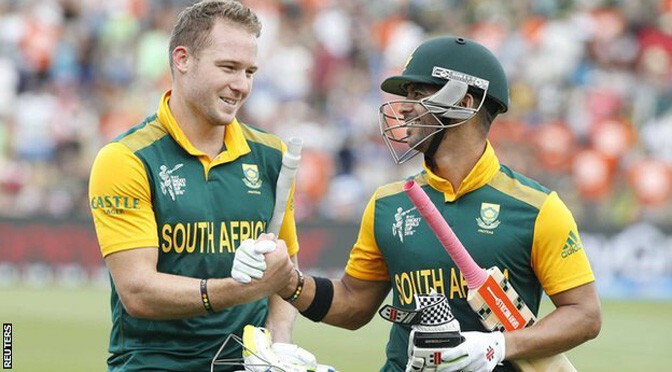 Duminy took until the final over to reach three figures, the highest one-day international fifth-wicket stand – and the third highest World Cup partnership for any wicket – reasserted South Africa’s supremacy. “We were in the game for a long time so it was a good sign for the games to come,” said Chigumbura.